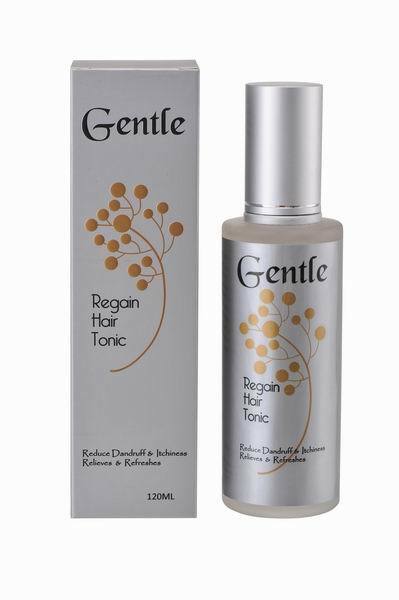 Gentle Regain Hair Tonic has a proven formula which reduces tiresome dandruff, relieves skin itch, smooth irritation, and prevents associated hair loss. Its exclusive multi complex nutrients strengthens your scalp's natural defences, and prevent it from becoming oily prematurely, yet storing the moisture. A daily massage with Gentle Regain Hair Tonic activates your scalp's metabolism and prevents skin irritations while menthol cools and refreshes, creating the prerequisite for a fascinating & healthy hair. Apply to your scalp in the morning, and after every hair wash. Massage in. Do not rinse out. Style your hair as usual. Daily application is recommended.